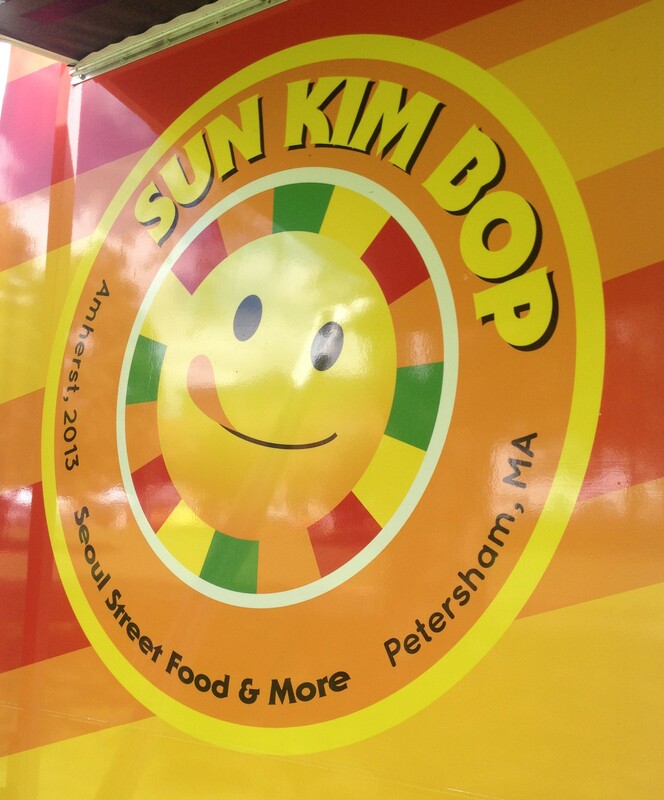 The Sun Kim Bop food truck hit the streets in Western MA in winter 2013-2014 but I just spotted it this past weekend on the Amherst commons. 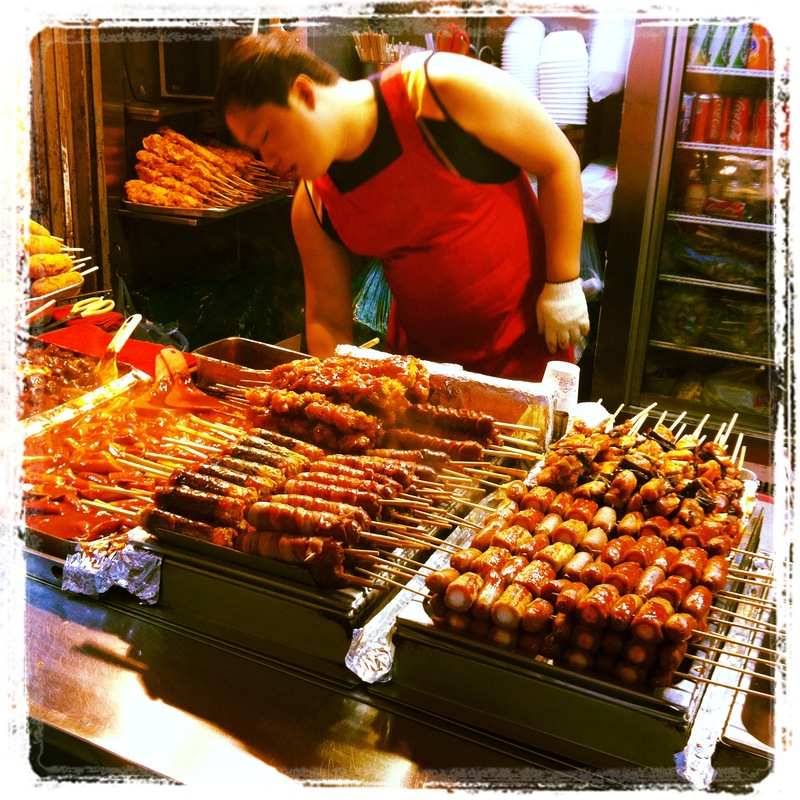 Despite its signage the Sun Kim Bop doesn’t really provide the full Seoul street food experience, there is no blood sausage and rice cakes in spicy sauce, no fish cake on a skewer, no grilled sheets of cuttle fish, no roasted sweet potato, no mini-sausages on a stick and no deep fried kim bap. But their website explains that Sun Kim Bop is trying to provide healthy food in “the essence of Korea’s famous street and picnic food”. The specialty of the house is their own creation, the Bop Burger. The bun of the Bop Burger is made of crisped rice seasoned with dry seaweed and sesame seeds and is filled with sautéed homemade kimchi, pork, beef or chicken. The truck also has some interesting looking kimchi tacos, Korean wraps, Kim Bap and has awesome vegan mandoo that taste and eat like meat dumplings. The Dumplings: The pan fried mandoo filled with minced vegetables, glass noodles and soy protein absolutely reminded me of the mandoo sold on the streets of Seoul and in the Lotte basement food court. Although these dumplings are vegan they had the mouth feel and taste of of pork mandoo, the soy protein really felt and tasted meaty and savory. They are served on a bed of chopped cabbage and julienned carrots that is drizzled with Sriracha, so the underside of each mandoo had some spicy chili sauce transferred onto it. These are some of the best dumplings in the Pioneer Valley. The Dipping Sauce: The sauce came in a tiny plastic container that was too small to really dip the mandoo so I didn’t try much of it. It seemed to be a soy and rice vinegar mix. The Location: Sun Kim Bop is a food truck so it moves around, but it seems to set up on the Amherst commons pretty frequently. Their Facebook and Twitter accounts provide times and locations. 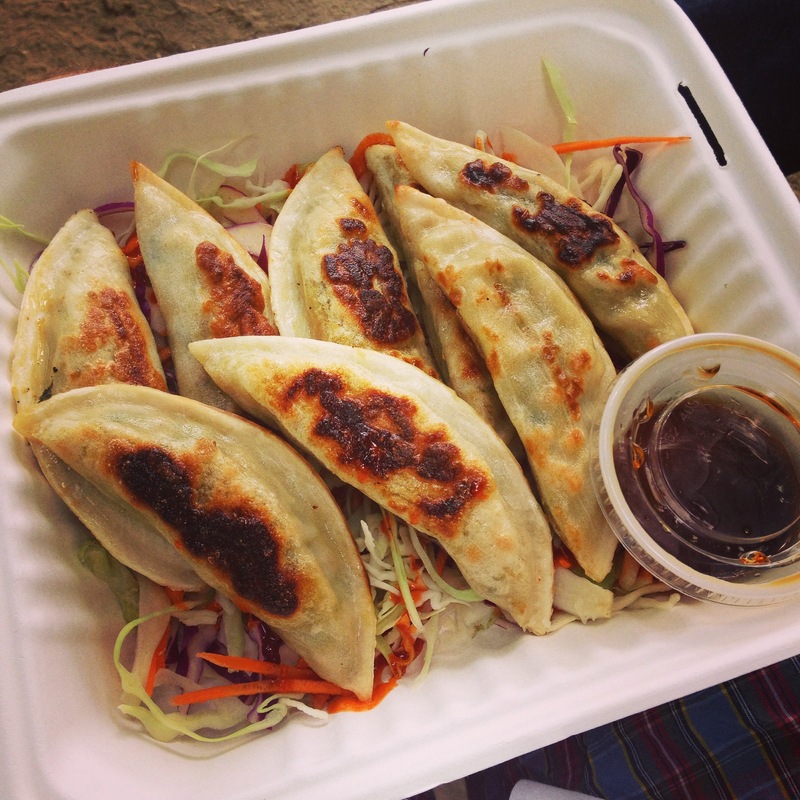 This entry was posted in Gyoza, Korea, Mandoo, Pan Fried, Vegan, Vegetarian. Bookmark the permalink. If I’m ever lucky enough to see it, I’ll try the mandoo.